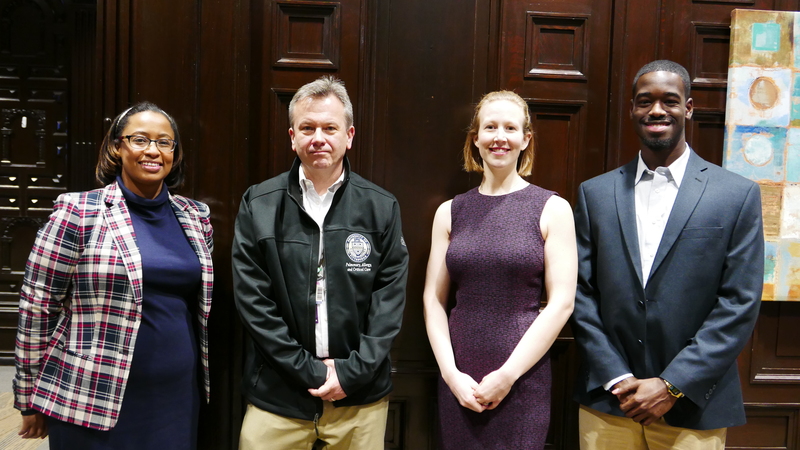 Members of the Fibrokine team include, from left, Cecelia Yates, Timothy Corcoran, Zariel Johnson and Christopher Mahoney. Technologies to prevent esophageal cancer and treat fibrosis, along with medical devices to improve IV insertion accuracy and to position and hold surgical tools have been awarded funding via the Chancellor’s Innovation Commercialization Funds. Two of the innovations received matching funds from the Pittsburgh Life Sciences Greenhouse (PLSG) and Innovation Works, the state’s seed stage startup investment fund, to cover the costs of forming startups around the technologies. “We are pleased to be able to provide the investigators behind these impactful innovations with critical funding to de-risk the innovations from an investor perspective and move them closer to making an impact in people’s lives,” said Innovation Institute Interim Director Evan Facher. Rich Lunak, president and CEO of Innovation Works, said he is pleased to support the creation of two new startups that have the potential to create jobs in the region. In addition to providing funding for two of the projects, Innovation Works and PLSG will provide resources, including expertise in market analysis, regulatory strategy, and management recruitment. Fibrosing diseases are estimated to contribute to 45 percent of deaths in the U.S, affecting the heart, lungs, liver, skin and arteries. Idiopathic pulmonary fibrosis (IPF) is a disease that limits oxygen transport and leads to respiratory failure and has a 60-80 percent five-year mortality rate with no current therapeutics capable of reversing fibrosis. Pitt investigators have developed anti-fibrotic peptides have the potential to inhibit IPF through development of an aerosol inhalation delivery mechanism. Current IV catheters rely on visualization of blood return to indicate vein entry and have no mechanism for assisting advancement into the vein. Approximately 90 million people in the U.S. each year require multiple attempts to establish IV access resulting in increased costs associated with employee time, patient discomfort and other adverse effects. The investigators have developed a system for administering IVs that utilizes measurement of electrical resistance of the tissue to which the needle is exposed in order to ensure accurate insertion. Esophageal cancer has a five year survival rate of only 19 percent. Despite the fact that pre-cursor conditions to the most common type of esophageal cancer, including Barrett’s esophagus, are easily identifiable, but effective treatment strategies are lacking. The investigators for Esophagel have developed an extracellular matrix that can halt progression of precancerous lesions and restore normal esophageal epithelium while mitigating damage that occurs following endoscopic removal of pre-cancerous and cancerous legions that often result from gastroesophageal reflux disease (GERD). Existing devices for holding surgical tools during surgery require costly setup, teardown and adjustment time during procedures, where operating room costs average $62 per minute, and where prolonged surgical time has shown to affect patient outcomes and complication rates. The investigators have created a quick-acting tool handling system that gives the surgeon the capability of self-retaining tool positioning in about 10 seconds. The system is based on a mechanically actuated flexible arm with a tool, such as a retractor, mounted at the distal end. The disposable arm is opened, snapped onto the universal base and positioned and can transition between flexible and rigid states with the click of a button.